HEMPESTEAD, N.Y. – The top-seeded Hofstra University women can secure two major accomplishments with one win Sunday. The Pride can lock up an automatic bid to the NCAA Division I tournament by winning the Colonial Athletic Association championship. The team will look to dethrone defending CAA champion and No. 3-seed Northeastern University in the conference title game at Hofstra Soccer Stadium at 1 p.m. The Pride (14-3-2, 9-0) eliminated No. 5 seed William & Mary College with a 1-0 victory in the semifinal Friday night to extend Hofstra’s winning streak to 11 games and its unbeaten run to 13. Freshman Lucy Porter scored the game’s only goal, knocking in a rebound from Madeline Anderson’s shot off a corner kick by Monique Iannella. Goalkeepers Jenna Borresen and Ashley Wilson teamed up for the Pride’s 11th shutout to drop Hofstra’s team goals-against average to 0.61. The Pride last advanced to the title game in 2014, but will be looking for a different outcome this time around. The Huskies were the top seed and the hosts in 2014, and topped then-third-seeded Hofstra, 2-0, to claim the championship. Northeastern (13-5-3, 5-1-3) made light work of No. 2-seed Drexel Friday, winning, 2-0, in the semifinals to return to the title game. Hannah Rosenblatt scored her team-leading eighth goal of the season against Drexel, while goalkeeper Nathalie Nidetch posted her ninth shutout. 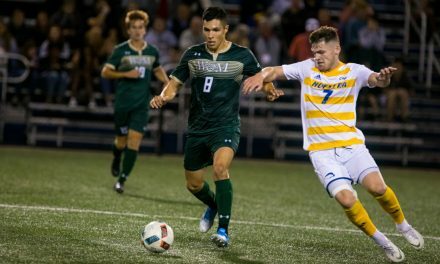 Hofstra topped the Huskies, 1-0, in the regular season in Brookline, Mass., with Porter netting the game-winner for Northeastern’s only conference loss of the season. The Pride holds a 14-8-2 advantage in the all-time series and has won the past three meetings since the 2014 final. The game will be broadcast on CollegeSportsLive and the College Sports Mobile app as part of the CAA’s package with CBS Sports Digital. Live stats and a Pride Productions Hofstra-based audio-only broadcast also will be available. Links to game coverage can be found on the Hofstra women’s soccer schedule page. The NCAA women’s soccer selection show is scheduled on NCAA.com Monday at 4:30 p.m.